Step into the windswept world of Ice-Age mammoth hunters. Walk through a replica of an 800-year-old pueblo dwelling and imagine your entire family cooking, eating, and sleeping in one small room. Explore the Aztec empire and its island capital, Tenochtitlan, a city of more than 200,000 people and an extraordinary feat of engineering for any era. Discover what Field Museum scientists and others have learned about the Americans who lived here before us, and how it’s changing nearly everything we thought we knew! The Field Museum’s ground-breaking new exhibition, The Ancient Americas, takes you on a journey through 13,000 years of human ingenuity and achievement in the western hemisphere, where hundreds of diverse societies thrived long before the arrival of Europeans. In this 19,000-square-foot permanent exhibition you’ll live the epic story of the peopling of these continents, from the Arctic to the tip of South America. Discover how and why the early Americans developed farming, created new forms of artistic expression, and forged mighty empires. See more than 2,200 artifacts, amazing reconstructions, and dozens of videos and interactive displays, and come to understand the ingenuity with which ancient peoples met the challenges of their times and places…as we meet ours today. 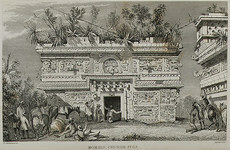 The Ancient Americas is made possible by the McCormick Tribune Foundation. The Farming Villagers Gallery is presented by the Abbott Fund. The Innovators Gallery is presented by ITW Foundation. An interview with Gary Feinman (curator of Middle American Anthropology) and Jonathan Haas (MacArthur Curator, Anthropology of the Americas) appears in the Spring 2007 issue of In the Field. Vanishing Worlds: Art and Ritual of Amazonia, a traveling exhibition of more than 150 rare and extraordinary objects, offers insight into the cultures and traditions of diverse native peoples of South America's Amazon region. Scientists believe that people have inhabited the Amazon region for at least 15,000 years. Prior to European contact, between three and five million people thrived in the Amazon region, an ecologically diverse land of 2.5 million square miles, home to lush rainforests, savannas and an unparalleled array of plants and wildlife. Today, fewer than 100,000 Amazonian native people survive. This exhibition, organized by the Houston Museum of Natural Science, offers a look into the traditional cultures of diverse peoples located in areas that stretch from the Atlantic coast of Brazil to the foothills of the Andes, south of the Amazon River. The objects in the exhibition come from the Ka’apor, Karajá, Tapirapé, Ticuna, Shipibo-Conibo, Shuar, Kayapó, and Xingu River region peoples. 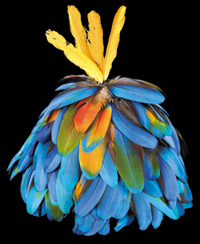 Colorful headdresses, masks, body ornaments, and full body costumes, as well as domestic and utilitarian pieces like basketry, weapons, pottery and textiles, are showcased. Read more from the Penn Museum news release here. Image caption: Kayapó-Mekrãgnoti headdress, roriro ri. 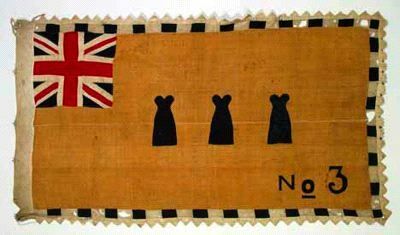 Worn by adult men during various ceremonies. Photo © Houston Museum of Natural Science. The Goldwater Library has a copy of the exhibition catalog. The figure sitting with legs drawn up atop this Peruvian drum is covered with complex symbols, among which are a snake that crawls from under the figure's chin and killer whales that outline each eye. See Arts of Africa, Oceania, and the Americas in the online collection for more information about this object. I attended a fascinating discussion last week about appropriation and visual art in the context of historical precedent and recent developments in copyright law. This panel was part of the annual College Art Association conference, but because of the interest in the topic, it was open to the public and held at the New York City Bar Association, at 42 W. 44th Street. 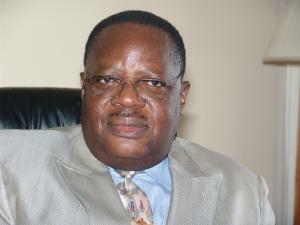 The panelists included the Hon. Pierre Leval, who first articulated the "transformative" test critical to all artists confronted with copyright infringement claims. Appropriation v. Piracy, Round Two? 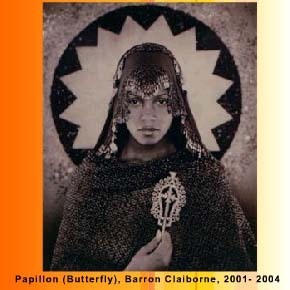 If it is the artist's role to trouble the comfortable and comfort the troubled, then the Black Madonna may be considered the artist's patron saint. She is a beacon of the defenseless and the defiant, the cast-aside and the changed. As our century speeds ahead, The Postmillenial Black Madonna Exhibition will give new focus to the troublemakers and the troubled- and their defender, the mesmerizing Triple Goddess of Creation, Preservation and Destruction, who promises that beyond the Inferno waits Paradise, and beneath Paradise burns the Inferno. Fifty years ago today, The Museum of Primitive Art opened its doors on West Fifty-fourth Street to the public. It was the beginning of a distinguished history of presenting the finest examples of material culture from the cultures of Africa, the Pacific Islands, and the Americas in ground-breaking, informative and imaginative displays. During those years the Museum also issued a succession of distinguished scholarly publications on these cultures and the finest private collections of the era. For nearly that entire period the Library of the Museum of Primitive Art offered an unrivaled collection of books and journals on art and anthropology combined with knowledgeable public reference. After nearly eighteen years the Museum shut its door on Jan. 1, 1975. Detail from The Hampton Project. Williamstown, MA—the Williams College Museum of Art (WCMA) presents Carrie Mae Weems: The Hampton Project. For twenty years, Carrie Mae Weems has made powerful artwork–often with a fiercely ironic sensibility–from complex social observations. 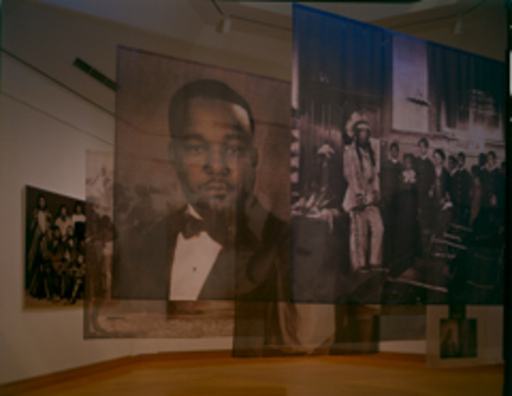 In this installation, part of the museum's permanent collection, Weems knits her concerns about individual identity, class, assimilation, education, and the legacy of slavery into a series of photographic banners that force viewers to reassess their own moral and ethical boundaries, as well as the political and socioeconomic realities of twentieth-century America. Weems’s Hampton Project is shaped in part as a response to the Hampton Album of 1900--vintage photographs by Frances Benjamin Johnston of the historically black Hampton Institute (now Hampton University) in Hampton, Virginia--and period images of African Americans and Native Americans . Her gaze is broad enough to encompass initial contacts between Anglos, African Americans, and Native Americans, the institution of slavery, the era of Jim Crow, the civil rights conflicts of the twentieth century, and the land claim disputes of the present. Weems’s ultimate focus, however, is her response to the philosophy of Hampton’s founder, and to historic and contemporary intersections of race, education, and the democratic ideal. Weems comments, “I’m interested in the tangled web of history, in the rough edges, and the bumpy surface, the mess just beneath the veneer of order.” In her effort to get beneath the surface, her compelling installation incorporates digitized historic images that are transferred onto muslin banners and stretched canvas and a poetic narrative that resonates throughout the gallery. The exhibition also includes the vintage photographs comprising Frances Benjamin Johnston’s view of Hampton in 1900, putting the works of these two artists in dialogue with one another across a time span of 100 years. Primitivism in the 21st century? Here's a Review from one of AAOA's own that provides some contrast to Times critic Holland Cotter's recent take on the show. "Primitivism Revisited: After the End of an Idea," an exhibition curated by graduate students of Susan Vogel from Columbia University at the Sean Kelly Gallery in New York City, is one of many recent shows (1) that reconsider controversial subjects of the past. It acknowledges that Primitivism, as it was once understood, is no longer a convincing framework to evaluate and compare art from different cultures, and reexamines it from the perspective of the 21st century. Primitivism refers to a period in the development of modern art that began when a number of young, primarily French artists began seriously to consider the aesthetics of sculptural objects from Africa, Oceania and the Americas. These objects inspired new and meaningful ways of visually inventing and structuring forms, and helped to forge a departure from the naturalism that dominated the art of much of the 19th century. This revolutionary moment in the early 20th century is regarded as the peak of Modernism and influenced such artists as Pablo Picasso, André Derain and Henri Matisse. However, even as certain objects of "primitive" peoples were elevated from ethnographic curiosities to prized artworks, little thought was given to their historical or cultural significance. Those who created the objects, moreover, were still seen through the racist lens of colonialism. The concept of Primitivism was extensively studied by Robert Goldwater and outlined in his 1938 landmark publication Primitivism in Modern Painting. Goldwater argued that similarities between African and modern art objects were almost coincidental and did not betray any deep cultural or artistic connections. Almost fifty years later, a very different viewpoint was presented at a controversial 1984 exhibition held at the Museum of Modern Art in New York City. Organized by William Rubin and Kirk Varnedoe, and entitled "'Primitivism' in 20th century Art: Affinity of the Tribal and the Modern," the exhibition produced a torrent of criticism and fueled debates which persisted for years. Unlike Goldwater, Rubin believed that an essential spiritual and aesthetic bond connected African and modern Western art. In pairing the works of renowned modern artists with "tribal" objects to illustrate similarities in form, Rubin and Varnedoe were accused of stripping the non-Western works of their social contexts and meanings and designating them as "low" art within a tradition of "high" arts. After the end of Primitivism as a historical moment and more than twenty years since the Rubin/Varnedoe exhibition, "Primitivism Revisited" attempts to explore different connections in light of post-colonial thinking, changes in cultural attitudes and globalization. 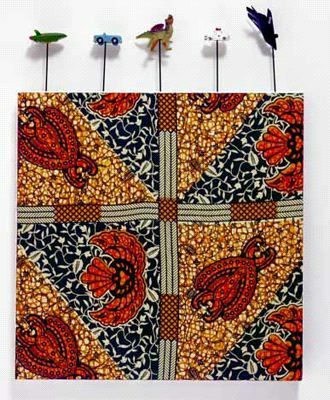 By juxtaposing examples of traditional African objects with contemporary art, the show offers (not so) new alternatives for viewing and understanding art. As a more fluid approach that centers on content more than form, the attempt falls short of displaying original themes, inspiring works, or cohesion. The show does little to add to the critical discussion that Primitivism initially elicited. The glaring inconsistency with this academic exhibition is that it takes place within a for-profit gallery, where themes and text are typically scant. Also, unlike the 1984 venture, Oceanic, Native American or Mesoamerican art are omitted, a decision influenced by the fact that Vogel is an Africanist and Kelly is personally vested in African art. 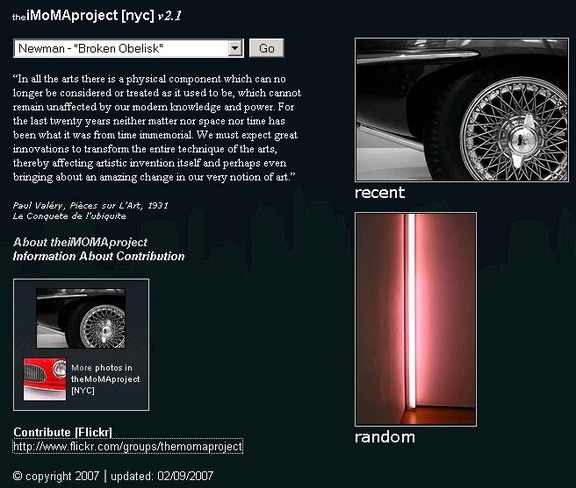 The extent to which student curators have creative control within gallery parameters and access to private collections, perhaps could account for the stretched associations between objects and themes. In addition, the questionable quality of some of the traditional African works does not meet the standards that one would expect within a show meant to showcase both genres. Such an undertaking seems better suited at a university gallery in which the students would not be burdened with crafting an exhibition for monetary gain. Locations are not neutral, as exemplified by Primitivism, and one must also question whether the students stumble into the same pitfalls as the original show by hosting it in a contemporary gallery. Afro-centric venues, such as the Studio Museum in Harlem or The Museum for African Art, are environments that have the potential present new interpretations of this subject. The exhibition space itself is divided into thematic sections, including "Manufacturing Authenticity," "Constructing Culture," and "Beyond the Display Case," each curated by two students. Although these themes may not have been used directly in relation to the concept of Primitivism in over twenty years, they certainty have been investigated in a number of Vogel's own provocative and pioneering exhibitions "Africa Explores" (1991), "Exhibition-ism" (1994), "Art/artifact" (1998) and in the more recent companion exhibits in Monaco: "7000 Years of African Art" and "The Contemporary Collection of Jean Pigozzi" (2005); the widely traveling "Africa Remix" (2005); and "Picasso and Africa" (2006) in Johannesburg. For a casual gallery viewer (or student curator) unfamiliar with this subject matter, these musings may appear to be new innovations. However, they are very much a part of the vernacular that non-Western art historians, museologists and anthropologists are all fluent in today, as a result of the critical dialogue that arose in the post-Primitivism era. New paradigms have emerged for ways of thinking about "primitive art," marking a distinct transformation in how exhibitions are conceived and how display strategies shape audience interpretation. Some of the exhibition themes highlight the connections between contemporary pieces and traditional works in a direct manner easily understood by the viewer. For instance, one section is dedicated to demonstrating that a gallery is an artificial place for showcasing certain artworks and that many objects cannot be understood without their performative contexts. A masking ensemble of the Bwa peoples of Burkina Faso is paired with masks composed of laser-cut mirrors, Naturalizations Masks (2003), by artist Pedro Lasch, that are meant to be worn by a participatory audience. In the background, a video of the Bwa dancing with their masks and children interacting with Lasch's masks are played on a screen to solidify the idea that, unanimated, the viewer cannot attain a complete appreciation. Although 1980s criticism certainly exhausted this concept, it is one niche that illustrates its argument in an explicit way. In the same room, the idea of the "fetish" is explored with a Songye personal power figure (nkishi) from the Democratic Republic of the Congo, featuring a lively composition of metal tacks that obscures most of its surface, as the centerpiece. This exceptional work was also included in the 1984 exhibition and has been featured in a number of notable survey books of African art. 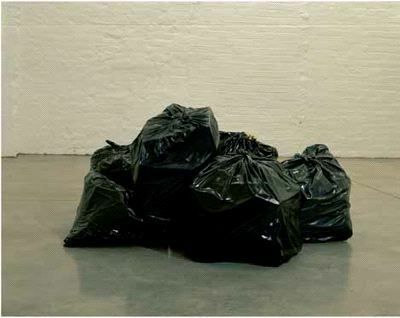 It is juxtaposed with Gavin Turk's Pile (2004), a group of naturalistically and skillfully rendered painted bronze garbage bags displayed on the floor, which deceived many into thinking they were actual rubbish. Pile inverts what is considered a valued object in a consumerist society, especially when it represents the most expensive work for sale in the exhibition. Also featured are Ann Hamilton's unusual portraits from (untitled) body object series (1986, 1984). 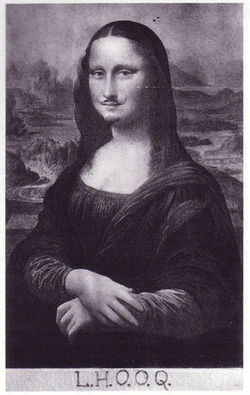 Despite outward similarities to "fetishes," they are included for the artist's theoretical, not visual, interests. Yinka Shonibare and El Anatsui, both successful contemporary African artists and the only two represented in the exhibition, are shown to meld cultures through the use of appropriation. Shonibare is known for his sumptuous use of textiles; Anatsui for his glittering textile-like constructions from found materials. Shonibare's Painting 25 (2005) and Anatsui's Key Issues at Buttonline #1 (2003), are clearly at the center of a globalized contemporary art world, yet responding to issues specific to the African continent. Adjacent to these works is an example from a less known contemporary artist, KD. In an advertising sign collected in Kumasi (early 21st century), an amusing portrayal of a clearly agitated man yelling into a phone with the heading "UNEEK Business Centre" is painted on sheet metal. It is a humorous observation on how many businesses in the West operate. The issue of tourist art and authenticity has been the focus of many ambitious exhibitions developed in the past twenty years. The debate plays out in a display of art made for tourists juxtaposed with traditional artworks highly valued in the art market. Among the tourist art is a reproduction of a Bamana chi wara headdress and an ambiguous contemporary mask from Nigeria with signs of age deliberately added. An object made from recycled materials, a creative genre prevalent throughout Southern Africa, is also featured in the form of a colorfully painted lion constructed from tin. As some sections employed exhaustive wall text to strengthen vague connections between ideas and artworks, others were inadequately explained, leaving viewers confused as to why certain objects were grouped together. "Primitivism Revisited" is an exercise in theory that wears on viewers' patience to struggle through each densely intellectualized section. 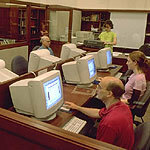 Given the relatively short amount of time students were given to mount such a task, the predetermined limitations of the project, and the impossibility of numerous groups working independently to make a consistent whole, one can hope that this endeavor was at least a learning experience for the students. 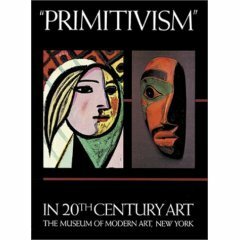 Primitivism holds a pivotal and infamous place in the study of non-Western art and cultures. Its aftermath spurred a new generation of exhibits that fostered more inclusive thinking. With this in mind, the ideas expressed in "Primitivism Revisited" cannot be considered original or a notable contribution to the already existing discourse on this subject. 1) One of the more notable is "Africa Remix" in 2005, organized at the Museum Kunst Palast in Düsseldorf, which reexamined "Magiciens de la Terre" at the Centre Pompidou in 1989. Both were curated by Jean-Hubert Martin. "Primitivism Revisited: After the End of an Idea," Sean Kelly Gallery, www.skny.com, 528 West 29th Street, New York City, NY, through January 27th.